"These are the BEST burgers I've ever had. My mother made a version of these and I changed it a little....instead of Jalapeno peppers you can add ANYTHING or just do the cream cheese...trust me...you're family and/or guests will BEG for the recipe!" Preheat a grill for medium heat. When hot, lightly oil the grate. In a medium bowl, stir together the jalapenos and cream cheese. 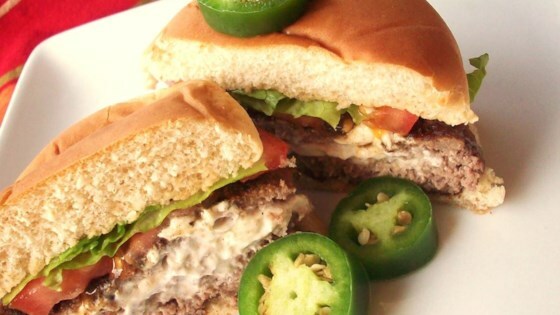 Delicious hamburgers with a cheesy, spicy surprise in the center. Holy Hamburger Heaven! Need I say more? I too mixed only 1 pkg of herb and garlic cream cheese right into the meat.